The latest UK GDP data confirm that the British economy remains in a crisis. As government spokespersons never tire of telling us the opposite, and are dutifully echoed by the majority of the media, then it is important to set out the factual case on the economy and to explain where the discrepancy between rhetoric and reality arises. The UK economy grew by just 1.8% in 2016. This is below the average growth level since the recession, which itself has been miserably weak. On a calendar year basis, the recovery began in 2010. Since then GDP growth has been an average of 2%, so 2016 was among the slower years in a poor recovery. In the 7 years prior to recession, from 2001 to 2007, GDP growth averaged 2.75%. The effect of compounding means that even apparently small differences in growth rates have a large impact on levels of economic activity over time. In the 7 years since recession, a growth rate 0.75% lower leads to a GDP level that is nearly 5.5% lower. Most people do not care about GDP levels, for the very reasonable idea that what matters to them is their own living standards. Of course, without GDP growth its level cannot rise and it is therefore extremely difficult to raise living standards in aggregate. But rising GDP is by itself no guarantee of generally rising living standards (Chart 1 below). In a society with expanding population per capita GDP will always necessarily grow more slowly that GDP growth itself. But the change on this measure has been dramatic. The beginning of this period saw growth rates in per capita GDP in excess of 3%. In 2016 it was one-third of that level, at 1.1%. Again the cumulative effect of compounding apparently small differences in growth rates is very substantial. 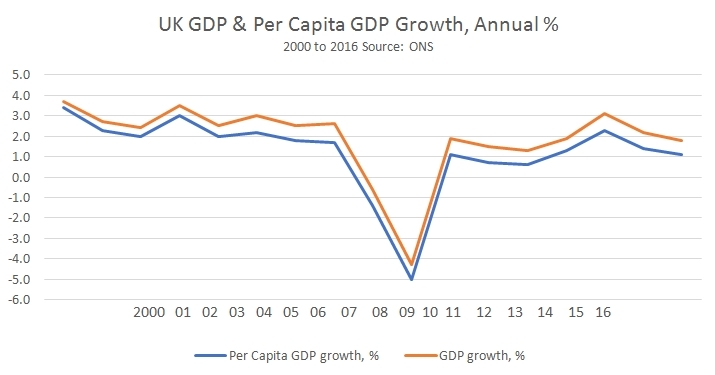 In the 7 years prior to the recession the level of per capita GDP rose by 16%. In the 7 years since, this measure of average output per person has risen by just 8.7%. If the period of the recession is also included, when per capita GDP fell, then the increase in per capita GDP since 2007 has been just 1.9%. No wonder most people believe the economy remains in a crisis. But the actual situation for workers and the poor is even worse than this data suggests. Severe recessions of the 2008-2009 type are caused by a fall in profits. 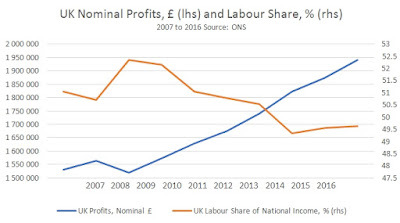 Although workers are clearly not better off from a recession, the statistical effect of a sharp fall in profits is frequently to lower the profit share and so raise the labour share of national income. In Marxist terms, the initial effect of falling profits lowers the rate at which surplus value is extracted. The purpose of austerity is to reverse this phenomenon, by driving down wages, raising taxes and lowering public spending that benefits workers and poor, at the same time increasing hand-outs to businesses and the rich, cutting their taxes and increasing privatisation of publicly-owned assets to boost profits, and so on. As we have already noted, per capita GDP has risen by just 1.9% since the recession began. But this is not shared evenly. 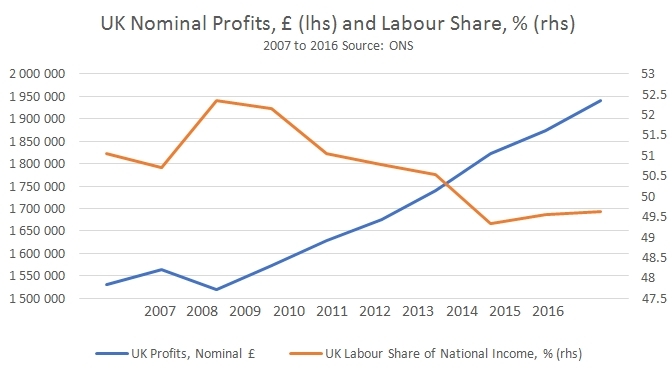 At first, the effect of falling profits has been to raise the labour share of national income (as shown in Chart 2 above). Austerity is designed to reverse that and has been partially successful. In 2007 labour’s share of national income was over 51%. Now it is just over 49%. Crucially, the labour share data is based on the compensation of all employees, including very senior management, whose total compensation has risen. Taking wages alone, the picture is even worse. The chart below is taken from the Financial Times. It shows 4 categories of countries in the OECD. The UK is on its own, the only country where the economy has expanded since the recession but where wages have also fallen. The GDP data reveal that the outlook for the economy is deteriorating. In a capitalist economy growth is determined over the medium-term by the accumulation of capital, first as profits then as investment. But profits growth remains weak and business investment actually contracted in 2016! The UK has had many failed experiments in attempting ‘consumer-led growth’, and the current failure is set to come to an end. Without rising incomes, which must be based on rising output to be sustainable, then all attempts to force Consumption to lead the economy end in a debt-fuelled failure. As Investment is key to the growth of output, only Investment can lead the economy higher on a sustainable basis. 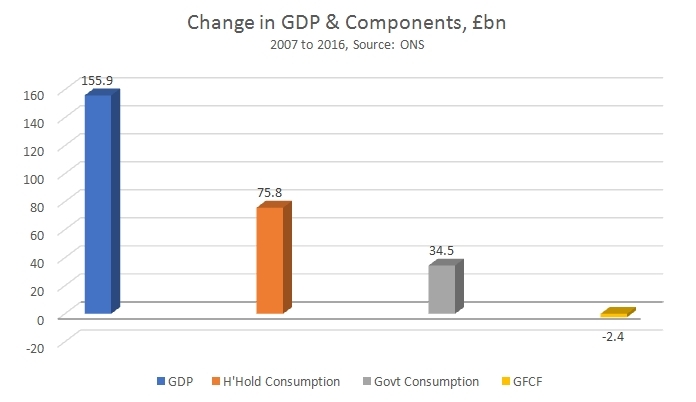 In 2016 Household Consumption accounted for almost the entirety of recorded GDP growth. GDP expanded by £35.5 billion last year, while household consumption rose by £34.6 billion. As we have seen incomes and wages have not risen to keep pace with consumption. In fact incomes have stagnated and over the medium-term wages have fallen. The growth in investment (GFCF, Gross Fixed Capital Formation) was just £1.4 billion over 2016. This continues the post-recession trends in the UK economy. Startlingly, there has been no growth in Investment (GFCF) since before the recession! In 2007 the real level Investment was £313 billion. In 2016 it was just £310.6 billion (Chart 4). SEB has repeatedly argued that it is not possible for Consumption to lead the economy. If it were possible, rising Consumption alone would be sufficient to induce rising Investment. But that is clearly not the case in the British crisis. The combined rise in Consumption from households and government since 2007 has been over £110 billion. But Investment has in fact contracted. The proponents of Consumption-led growth have no credible explanation for these developments. Without Investment, and with Consumption forced to retreat without the support of rising output and incomes, then the medium-term outlook for the economy must be a gloomy one. Brexit poses a new problem in the British economic crisis, and one which will exacerbate the current trends of low investment and falling real wages. It is also likely to lead to job losses in key sectors. The CBI estimates that 90% of UK exports to the EU will be hit with either tariffs or non-tariff barriers, or both. This would be a very large blow to UK businesses and their profits. The question that arises is therefore, how to increase profits in an environment of contracting access to key markets? The answer must be to do more of the same, driving down wages, increasing taxes, privatisation, reductions in social spending, and so on. The promise of the Tory government to its business supporters will be that all this can be accelerated once freed from the shackles of EU protections for workers’ rights, consumer standards or environmental regulations. It is doubtful whether this can work. If output continues to grow very slowly, then labour’s share of national income must fall sharply in order to boost profits sufficiently to revive investment. The share of the total social product which benefits workers and the poor must be cut exceptionally harshly, and so on. But the probability of failure will not prevent the project from being initiated. It will be a Poundland Thatcherism, draping vicious anti-worker and anti-poor policies in the cloak of nationalism and ‘getting the country back’. 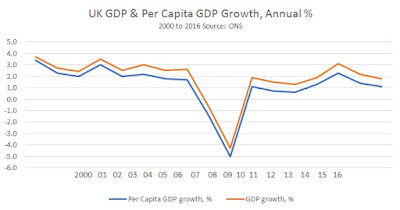 The rhetoric about Britain’s great economic performance is simply that. It has no factual substance. Living standards have fallen since the crisis. 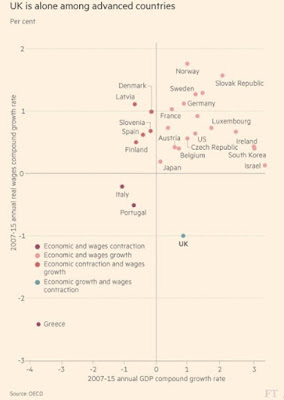 The UK is in a unique position among the advanced industrialised countries as GDP has expanded but wages have contracted. This is a conscious strategy to revive profits. Until they revive sufficiently, investment will not recover. But the new challenge of Brexit means that this project must be redoubled. From the perspective of the Brexit-supporting Tories, there must be a compensation for business to off-set the loss of access to its major market. The struggle over the direction of the British economy is set to be a prolonged one.